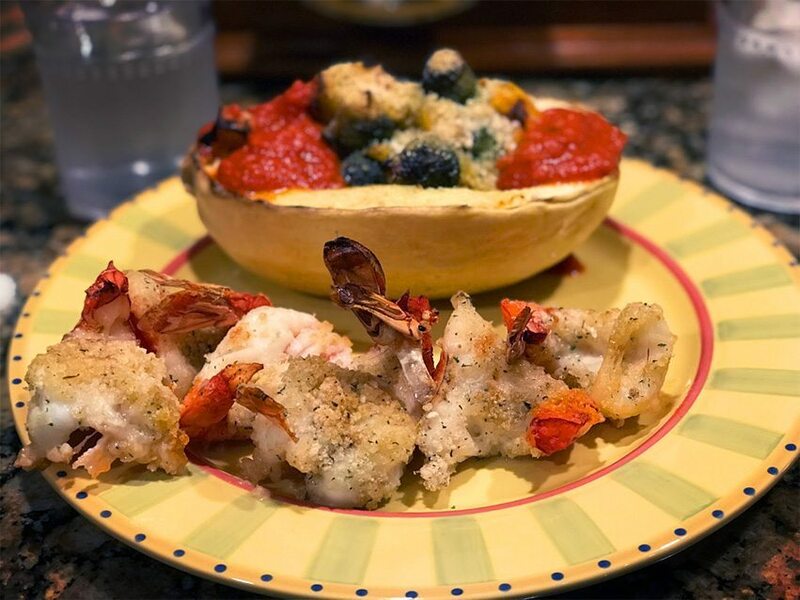 Instead of pasta, these gluten free spaghetti squash boats rely on the roasted spaghetti squash, which shreds into thin, noodle-like strands when scraped with a fork after baking. I added cubed and roasted butternut squash, brussels sprouts and butterflied and baked shrimp for color and an extra serving of veggies! Also for this recipe, you’ll want to use spaghetti squash that are on the smaller side since they’ll cook faster and each person will get their own boat. 1. Preheat oven to 375° F. In a large bowl, combine the brussels sprouts, butternut squash, olive oil, salt and pepper and arrange the vegetables on a baking sheet in a single layer. Bake 40 minutes, or until the veggies are roasted and tender. 2. Cut spaghetti squash in half lengthwise and scoop out the seeds. Drizzle with olive oil and season with a pinch of salt and pepper. Place cut side down on a baking sheet and bake alongside the butternut and brussels for 30 minutes. 3. While the veggies are in the oven, butterfly the shrimp by slicing down the vein line from the tail to the top. Slice as deep as possible without cutting all the way through. If you want to prevent the shrimp from curling during cooking, you can turn the shrimp over and make 3 small shallow slits horizontally across the shrimp, being careful not to cut all the way through. Season with salt and pepper and set aside. 4. To toast the crumbs, place desired amount in a large skillet on the stove on medium heat. Keep an eye on the crumbs and toss occasionally until they start to brown. Lower the heat some and use a spoon or other tool to stir the crumbs continually until toasted to your liking. Remove the crumbs immediately from the hot skillet. 5. Mix the eggs in a separate bowl and dip the shrimp in the egg mix to coat letting the excess drip off. Then coat the shrimp with the bread crumbs and place on the baking sheet, cut side down. Bake in the oven for 10-12 minutes. 6. Scrape the squash strands into a pile of “pasta” in the squash shells and top with the brussels and butternut squash mixture and serve with a side of shrimp. I sprinkled the gluten free bread crumbs over the top of the shrimp, then baked, to keep it low carb and more as a garnish. Then I added a lil’ sprinkle of Parm to the veggie mixture and a scoop of marinara sauce for even more flavor!